Today, we’re going to be talking about William Shakespeare. Yeah, I know some of you look forward to this about as much as you look forward to root canal work. At some point during the childhood or teenage years of many humans, they are taught to fear Shakespeare. They are taught that it is difficult to study and that they will hate it. When the time comes to study it in school unless they have an amazing teacher they probably will hate it. If they are lucky as I was, their school has an excellent drama department with a drama teacher who inspires their students and loves Shakespeare. That teacher will teach them to love words and to savor Shakespeare like they would savor good Lindt chocolate. But now, they might be lucky enough – at an appropriate age because this movie does contain some quite saucy love scenes – to have a teacher or a parent who shows them the movie Shakespeare In Love. 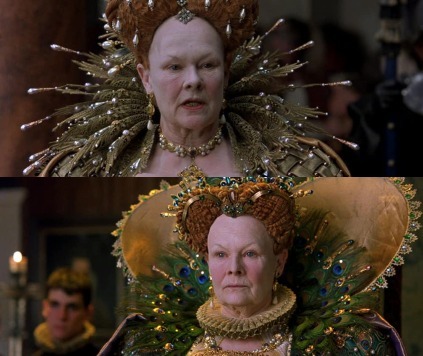 Many of the works of William Shakespeare had been recreated on both television and in movies but this movie is unique because it is a fictional version of the life of Shakespeare himself. Fortunately when they did decide to tackle it they made it a comedy. What a comedy it is, too! If you have not seen it, you must. So why do I love this movie so much? I could sit here and write reasons why all day long, but here are the top 5. If she is in a movie you know it is going to be incredible. The costumes she had to wear were huge and heavy as you can see above. Her portrayal of Elizabeth was exactly perfect. Everyone loves Colin Firth, right? Well I do anyway. I think this is one of his best performances. You can tell he is enjoying it. Usually he plays the opposite kinds of roles to this. She pulls off quite an acting feat in this movie. I don’t want to spoil the story in case you haven’t seen it but let me put it this way. In the movie she plays more than one character. One of the characters has long hair extensions. The other character could not be played with the long hair extensions. She spent a lot of time in the hairdressing chair and on average it was 2.5 hours each time they had to put the extensions in. And gentlemen, you get to see her half naked. She said in the commentary track that she wanted the love scenes to be realistic rather than being worried about covering herself up. On top of all that, she’s speaking in an English accent. He is the brother of Raiph Fiennes – and note that is spelt Raiph and pronounced Rafe and not Ralph – who is a very well known actor. Joseph is amazing. I could not imagine anyone else playing this role. He has the most gorgeous big brown eyes. 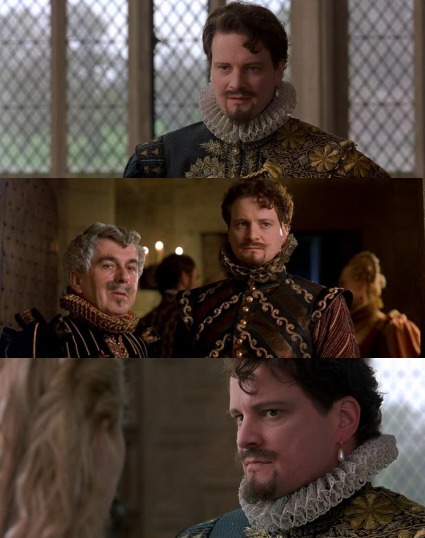 He was also in another of my favourite movies – Elizabeth with Cate Blanchett. Geoffrey Rush is in the movie and his character is hilarious. Normally I can’t stand Ben Affleck but he appears in this movie and I actually quite liked him in this role. The DVD version I have includes two commentary tracks, one with the director and one with the cast and crew. Both are very interesting. If you enjoyed this review, you might also enjoy these other reviews. Romeo + Juliet – a review.. The Pirate Movie – a review. I had a high school teacher who loved Shakespeare and taught his students how to be as enthusiastic about the plays as he was himself. I also had a whole college semester of Shakespeare and I think I appreciated it more because I’d had such a good introduction to it in high school. I hope the movie inspired people to become more interested in the plays. Although they’re difficult for many modern readers, it seems like once you get familiar with the language, you can enter into that world and it all becomes alive. I’m looking forward to your Jane Austen series – I love her novels too, I think she is so witty and funny and observant. *sigh*. Too much yummy goodness there. I agree about the teachers. Our introduction to Shakespeare was to watch any movie with a good looking actor in it. By the time we were on the 3rd movie, we found we understood the words without studying, and thus developed a lifelong love for many of us. Plus, the enthusiasm of a teacher who on long service leave after 32 YEARS!! at the same school, went on a “Shakespeare tour” of the UK, well, you can imagine the dedication. I totally love this movie, it’s definitely on my “can watch a million times” list. And I agree too about Ben Affleck. I think everyone was fantastic in the movie. I just love it! I love this movie. I’ve seen it more than 10 times (I think)…I know the lines..I love the acting…Love Gwyneth Palthrow (she became one of my fave actresses which include Ingrid Bergman and Audrey Hepburn)..Joseph Fiennes was amazing..
Well everything in the movie was amazing…even the love scenes..hehehehehe..
Oh by the way..thanks for the info..i didn’t know about Gwyneth’s hair extention and thank you for the info on Ray Fiennes (didn’t he call himself that? )…i always thought it was Ralph..Raiph it is! I still have not seen this. I love Ralph Fiennes and have heard hos little bro is a fine actor too! Damn Judy was great in Notes on a Scandal recently, you have to see it!